designed and presented by Balmain’s Creative Director, Olivier Rousteing. Before word got out that H&M was doing another stunning collaboration, it was astonishing to see Kendall Jenner and Jourdan Dunn strut pieces from the collection at the Billboard Music Awards back in May. Then we were blessed with an ad campaign featuring Gigi Hadid in September, making it even more official of what deliciousness and glamour was set to hit the racks and website of H&M. When we were given a sneak preview of the collection, we only got to see a few pieces, but now we have the entire look book to present to you. Just last week, the pieces for both the Men’s & Women’s collection, along with the prices were released to the web, or even possibly leaked on Instagram. The collection is absolutely stunning, prices range as high as $700, but also go down to under $100; and we can assure you Rousteing definitely signed, slayed and delivered! Last night, Oct. 20, Rousteing held his Fashion Show presentation for the Balmain and H&M collaboration in New York City at 23 Wall Street. Kendall Jenner opened the show wearing pieces from the collection and shared the runway with fellow models such as Gigi Hadid, Jourdan Dunn, Joan Smalls, Alessandra Ambrsio, and Bella Hadid. “I think the concept for H&M x Balmain is putting the couture in the stores. 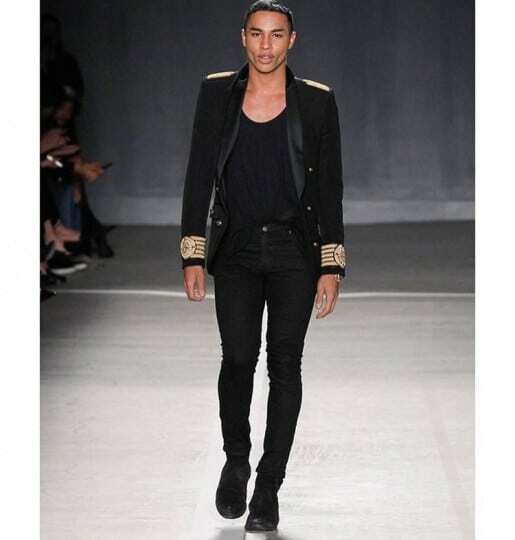 It’s a really rich and strong collection that is infused with the Balmain DNA,” states Rousteing. The collection hits stores Nov. 5. Take a peek at the collection below, and let us know what pieces you’re sure to consider adding to your wardrobe.